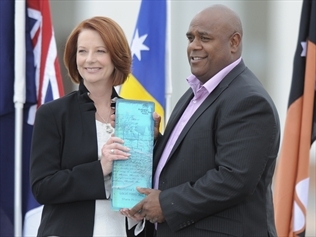 AUSTRALIA’S 2013 Local Hero Shane Phillips plans to share his award with his indigenous community in Sydney’s Redfern. The 48-year-old father of three, who is a respected member of the Redfern community, received the honour at the Australian of the Year awards ceremony in Canberra on Friday. Mr Phillips described himself as a “real Redfern boy”. “It’s a community at work,” he said. “We’re not being reactive, we’re being proactive. “This goes out to a lot of kids, and our elders, who have written themselves off or have been written off. Mr Phillips is regarded as a man of integrity and a community voice on issues such as juvenile justice and Aboriginal deaths in custody. He still lives in Redfern, where he was born. Mr Phillips said he wanted to embark on a journey with the rest of the nation on the mentoring program he operates for Aboriginal and Torres Strait Islander youth. “I am going to teach our kids to be surrounded by people who are positive and constructive and strategic and to help them with their lives,” he said. Immigration and citizenship minister Chris Bowen said Local Heroes like Mr Phillips selflessly donated time and effort to make their communities a better place. “He is a fantastic example of the impact one person can have on the lives of so many other Australians,” Mr Bowen said in a statement. Mr Phillips is chief executive of the Tribal Warriors Association, a non-profit organisation offering job training and emergency relief for struggling families. Improvements in relationship between the Redfern local community and local police in Redfern has also been credited to Mr Phillips. The number of robberies by local youth in Redfern has dropped by 80 per cent since 2009, following the introduction of a program called Clean Slate Without Prejudice, run in collaboration with police. “It has helped each side understand and appreciate the other,” he said. A spokesman for Redfern community group Redwatch, Geoff Turnbull, said Mr Phillips’ award was well deserved. “Shane is one of the champions of this area. He’s been very involved in working with Aboriginal youth in particular and basically providing a whole pile of hope for people,” Mr Turnbull told AAP. “If you go back about 10 years when things were quite dire in Redfern, Shane was one of the main people who worked to turn it around.